Vale Food Co. is opening up a new restaurant in Riverside, offering its customers affordable all natural, healthy and delicious foods and meal plans. Photo: Twitter. 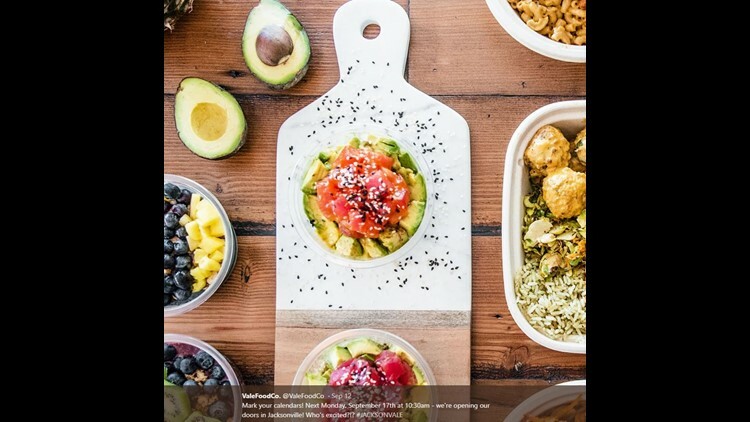 When you walk in, you can choose to customize your own bowl of food or you can choose from one of the menu items made to order like acai bowls, poke bowls and avacado toast. Most of its menu items are vegan-friendly and gluten free. Eating healthy can be expensive, but there's a new restaurant that's opening up in Riverside that's changing the game by offering its customers more affordable food items and meal plans that are all natural, fresh and healthy. Vale Food Co. is celebrating its grand opening at 90 Riverside Ave No. 603 in the Brooklyn Station in Riverside on Monday, Sept. 17 at 10:30 a.m. This marks the fourth Florida city it spanned to with locations in Tallahasee, Gainesville and Tampa. When you walk in, you can choose to customize your own bowl of food -- made of one or two bases, veggies, a protein and sauce -- or you can choose a dish on the menu like acai bowls, poke bowls and avacado toast. Most of its menu items are vegan-friendly and gluten free. Customers can expect to spend less than $10 on a bowl while the average meal plan is around $60, but varies on how many days/months you order. Customers took to social media to describe how they felt about the food. Most said they never expected healthy food to taste so delicious and flavorful. Dreaming of this meal I had back when I was visiting FSU. In my 3 days there I went to @valefoodco twice and ordered 2 meals both times because it was that good! The buffalo tofu in this bowl was so delicious!